Was I excited yesterday to kickoff CicLAvia week? Obviously. What about today now that I can talk specifics? Even moreso. With last year being my first preview, I tried really hard to charm the pants off of the whole wide world mentioning every single detail possible. Now that I have some clout(I have three times more twitter followers now), I’m going to speak a bit more from the heart about the places that talk to me most. Part one features mostly attractions on the course, but also a few others that I would kick myself if I went all the way out there and didn’t see, even though I was just blocks away. Plus, as you’ll see, some of them I included for some context. A couple of notes before we delve into this. First, the preview goes from South to North. 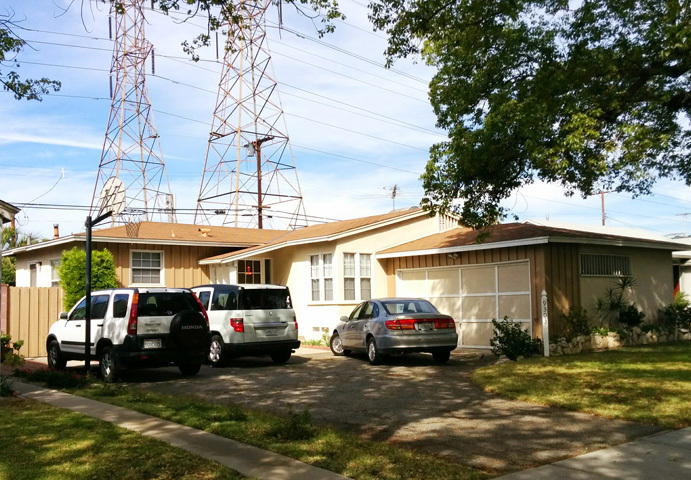 One thing that may confuse you is the changing addresses along Van Nuys. The street numbers steadily rise going northbound until it veers off its cardinal direction in Arleta. 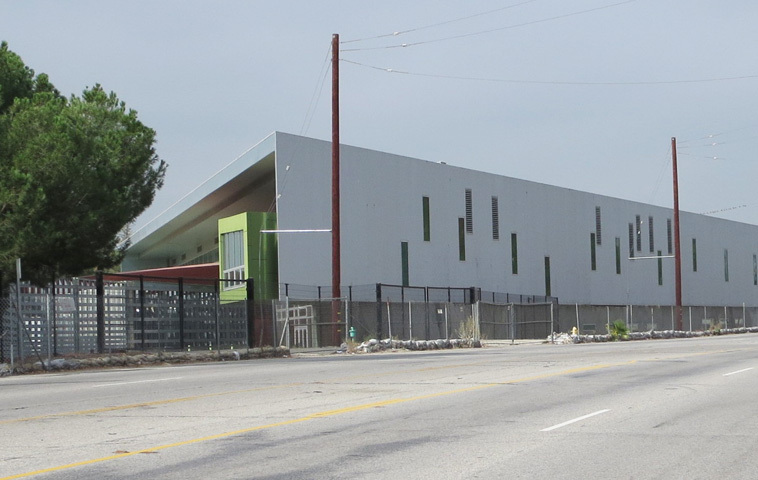 Then, it rises from 9000’s to 14000’s where the numbering now decreases through Pacoima. This is one of the few streets I can think of in Los Angeles that changes from a north-south street to an east-west through its addressing. 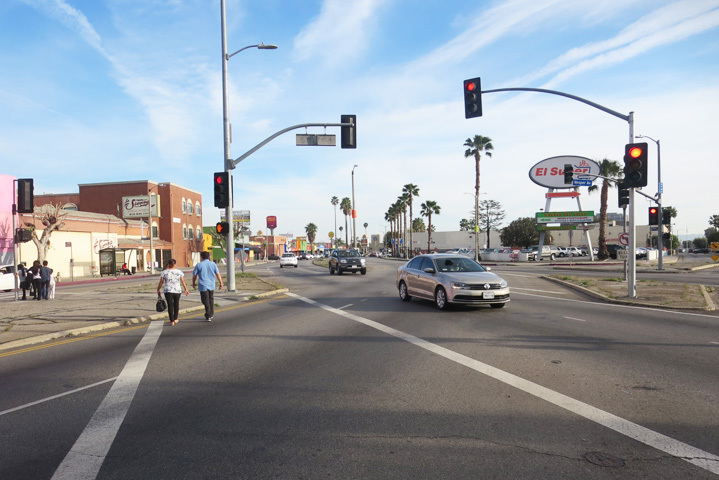 Since I’m talking infrastructure, Van Nuys Blvd. 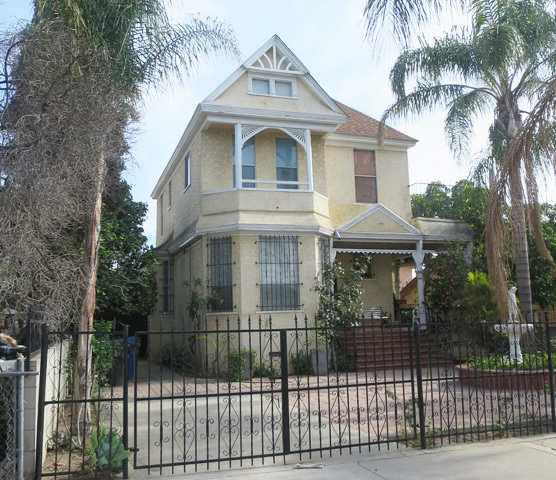 was originally named Taylor Ave. through Pacoima after the president, while it’s current name takes after one of the most important developers in Los Angeles history, Isaac Van Nuys. I really wish I would have run into a descendant by now. The valley grew quickly in the middle part of the 20th century with industry playing a large roll. One of the gone, but not forgotten landmarks is the former GM plant next to the Amtrak Station. 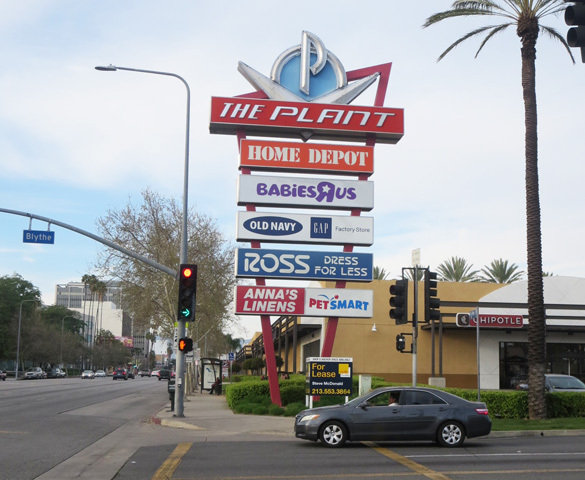 Now home to a large shopping center called the Plant(Grant High’s Tom Selleck developed it), this 68 acre lot used to produce the Camaro, Chevelle, Monte Carlo, Corvair, Firebird and a number of others. When it closed in the 1992, many families in the area were greatly affected, a stress I could see from some of the children I went to school with. If you check out the mural under the rail tracks, you’ll get a little bit of history and understanding why this spot was so important. 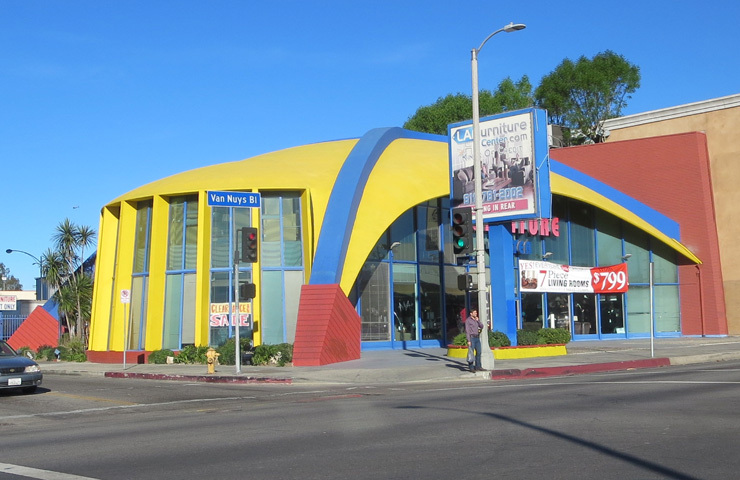 Having getting my teeth straightened down the block for years always made me admire this mid century classic. 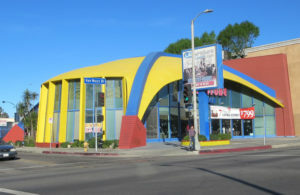 Built in 1957 as a Great Western Savings, this structure still retains its form, while the colors have clearly changed. I always thought this is the best example of post war architecture exemplifying what a growing Panorama City was trying to look like. I should also mention that when the city was founded in 1948, they were working hard to keep the neighborhood entirely white. Didn’t you expect a mall here in the valley? The Panorama Mall was built in the 1950’s and like the rest of the area, has taken it’s share of punches. This mall used to have a more distinct mid century look to it(see, a theme), but in order to attract from a waning customer base, the complex has gone through a few facelifts along the way. If you look just to the west for the long shuttered Montgomery Ward still sits alone in an area that also used to include a Robinson’s, Broadway and Orbach’s. The reason for safer streets? Not a lot to see, but I’ll be mentioning these lanes more on Thursday. Just some cycling background, bike lanes were added to Chase Street not that long ago and recently, there has been a movement to erase them by some neighborhood activists. 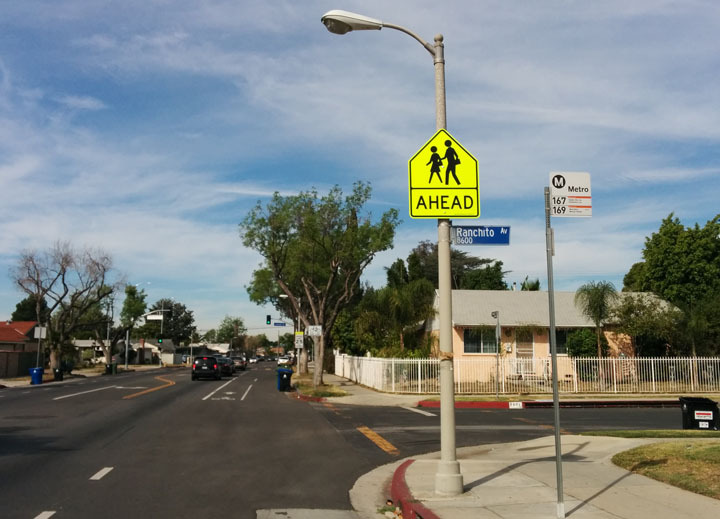 CiclaValley has documented this issue before and knows the value that bike lanes can add to the entire community. 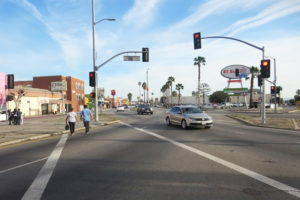 On the other side of Van Nuys Blvd., the long awaited Parthenia lanes would be a game changer, as traversing this portion of the valley east-west has always been problematic. Let’s hope they become a reality soon to build a stronger network. Sitting kitty corner to reworked Panorama Mall, this outdoor mall is quite the contrast. With about one hundred stores, there always seems to be foot traffic flowing. The main attraction is the number of performances that take place in its main courtyard. If you’re walking by, you’re bound to join in. You don’t think anything special will be going on during CicLAvia, do you? 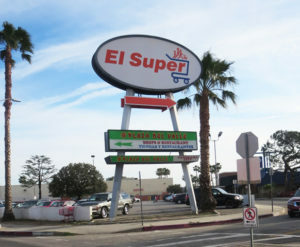 The only vestige of an era long gone, the El Super sign was originally erected for the Hughes Supermarket, which used to sit at this location. For those that don’t remember, Hughes used to be a fixture across Los Angeles with its first stores opening in 1952. 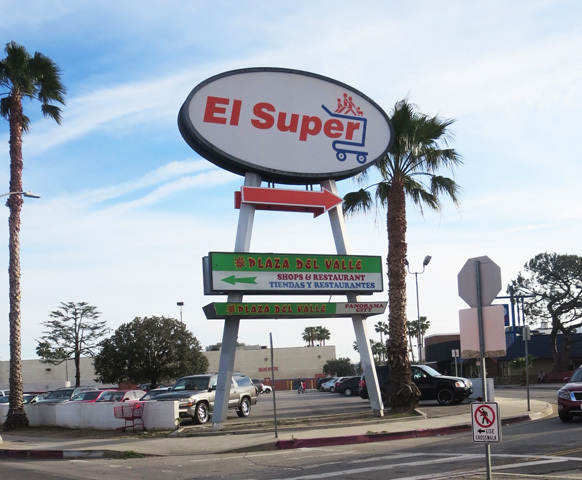 This chain quickly spread quickly across the region, but it lasted only until 1997, when the entire company was bought by Ralph’s. While there is no real physical trace of the Red Car, you can tell by the construction of the street that something used to be here. After turning up Chandler, this line used to continue up Van Nuys Blvd. until it started taking a serpentine turn on Parthenia to make its way up to San Fernando. I could say more, but maybe you should brace yourself for Part 2. Bowl Kings Bowl! We’ve never had a CicLAvia with an ice rink on the course until now(Pasadena was a block away). Built originally as a bowling alley in 1955, this facility was converted into a skating facility at the turn of this century with a second ice rink added later on(it was roller for a time). 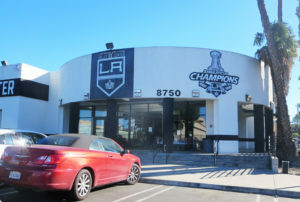 This facility now has the LA Kings footprint on it, but during the Gretzky era in the 1990’s, the team used to practice exactly three miles west of here before they moved to the larger El Segundo facility. You’ll still find vestiges of the old bowling alley inside, but now the rink plays host to UCLA Ice Hockey games. There isn’t a sign more of an eye grabber in the area more than the Panorama Theater. 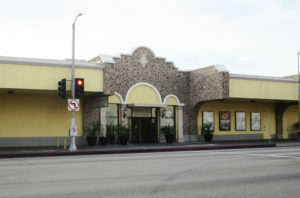 Built in 1949, this theater originally seated 1,000 patrons until it was split into two about twenty five years later. Rolling by, it’s impossible to miss the classic mid century marquee directed high above Van Nuys Blvd. 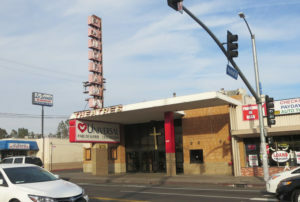 Now serving as a church, you are still a few of the building’s original elements inside. This is about a mile off the route, but I could hear someone complain if I left this out. I just decided to add it because I can’t resist using that quasi-pubescent Marty McFly voice. Mom? Doc? Hoverboard? I really could go on. The house itself hasn’t changed much since the movie’s 1985 release, but still don’t interrupt the inhabitants even if you’re Crispin Glover. You weirdo. The electrical tower in the back may seem inoccuous, but actually it lays along a swath of mainly undeveloped land that was laid aside for the unrealized Whitnall Highway. To cover all the murals along this one mile stretch, for what is commonly known as the “Mural Mile”, is impossible. Because some of these twenty one artworks are angled behind buildings, I feel like I discover a new one every time I come by. 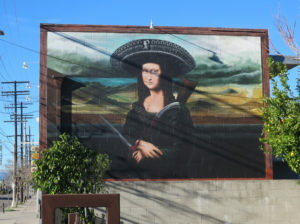 I will mention a few of my favorites which I’ll include “The Lady of the Valley” by local artist Levi Ponce. It is properly placed, almost serving as a gateway, as the first mural to greet you before you enter this significant stretch. Don’t fret about the name, you’re still in Los Angeles. 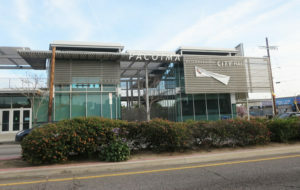 The Pacoima City Hall was built by world renowned architect Michael Rotundi in 2004, serving the neighborhood in a number of ways. 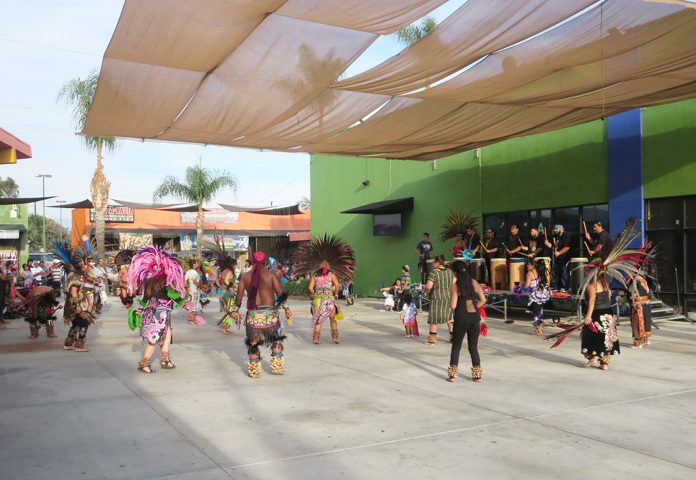 LA City Councilmember Felipe Fuentes, community organization Pacoima Beautiful and the new Cafe O Muerte call this facility home. The courtyard is a set up for community events and outdoor movies, and on Saturdays there is a food exchange that will be held specially for CicLAvia as well. It’s impossible to pass up this commemoration of one of the greatest tragedies in music. 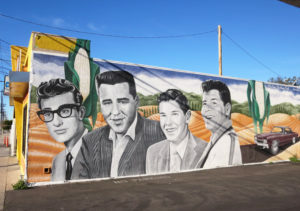 In 1959, a small plane carrying Buddy Holly, The Big Bopper, Ritchie Valens and pilot Roger Pederson crashed in Iowa killing all inside. Valens, who spent the majority of his life growing up in Pacoima, died before ever reaching his 18th birthday. 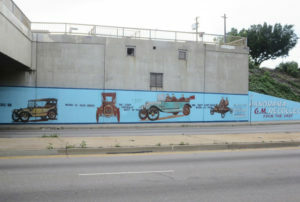 In the mural itself, Levi Ponce paints a Chevy in the background, which Don MacLean alludes to being driven to the levy in his song “American Pie”. 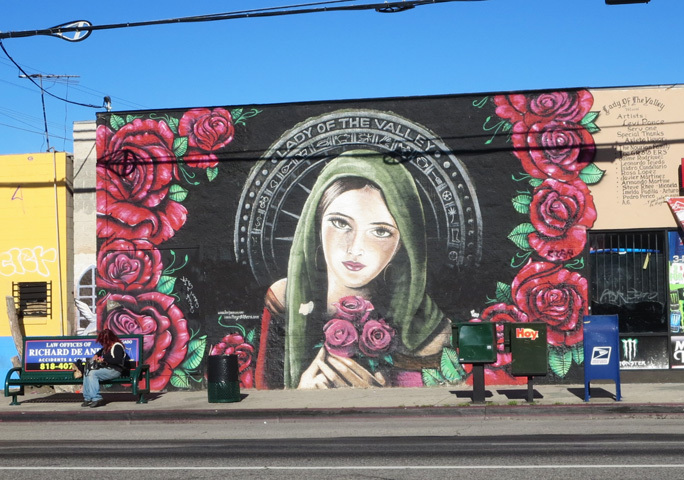 Histrionics aside, it’s hard not to fixate on yet another mural by Levi Ponce. 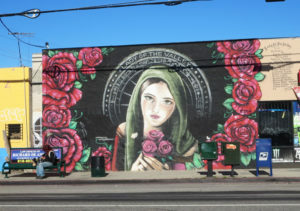 This artwork makes a strong statement that Pacoima is in the midst of an art revolution which has truly taken hold since this piece was finished four years ago. A fully weaponized Mona Lisa helps make the point. I also believe it’s quite a bit larger than the original at the Louvre. Haplessly in need of a warm beverage one night, I was glad to discover Mi Kaffe tucked away in a mall. 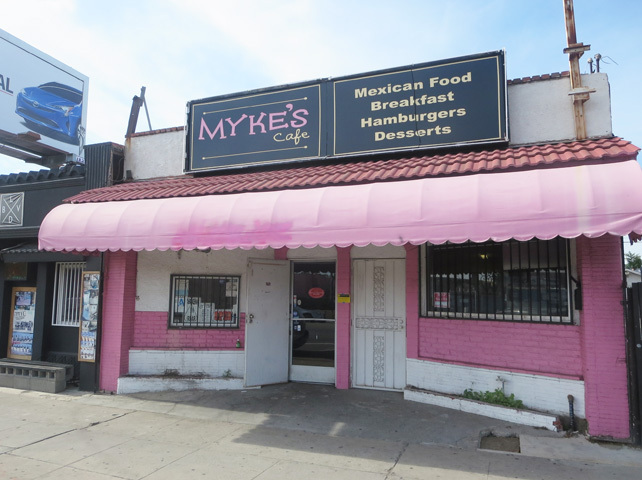 At the time, it had recently opened and lays claim to being Pacoima’s first coffee shop. It has a real family atmosphere and Gloria will greet you with a big smile. Normally closed on Sundays, they’ll be open for the big day, so grab a cup of joe and tell them CiclaValley sent you. 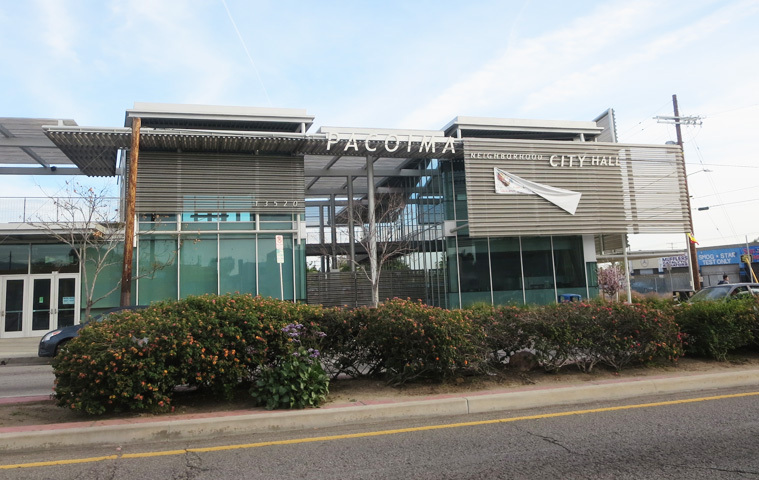 While there may not seem to be many homes of architectural significance in Pacoima, most people don’t realize this city has its roots from over one hundred years ago. Many of the homes retain their original form, but good portion were stuccoed over instead of replacing their wood paneling. Another clue to its past is the smaller scale of the streets compared to the rest of the city. When you take a look at this house, imagine what it used to look like in all its Victorian glory and then try looking at the rest of the neighborhood with the same glasses. 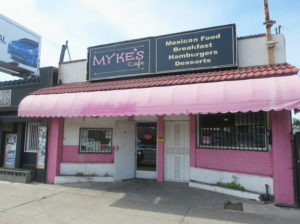 Mention the name Myke’s to anyone from the area and it’s hard for them not to elicit a smile. It is a local favorite because it retains its individuality, keeping a “F it! This is what we’re doing attitude!”, even if the wording “hole in the wall” is mentioned. The food has it’s own angle, with such items red velvet pancakes, mole burger, beer floats and other delectable oddities gracing the menu. 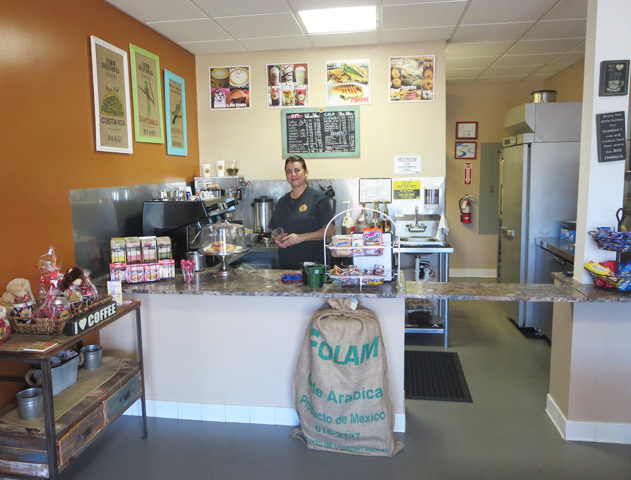 The ambiance and service may be a bit haphazard, but that’s part of the charm. A bit off the beaten path, but if you’re bringing kids, this is good to keep in your back pocket. For those that remember the Children’s Museum shut down in 2000 from its location right across the street from City Hall. It was supposed to move into this space in the Hansen Dam complex long ago, but this building sat dormant as for years there was no funds to put anything inside, something I covered here. The Discover Cube finally opened in late 2015 and has been hitting its stride since. I always take my daughter to the Kings exhibit because I know that somebody down at the Orange County location is trying to indoctrinate their kid to be a Ducks fan. 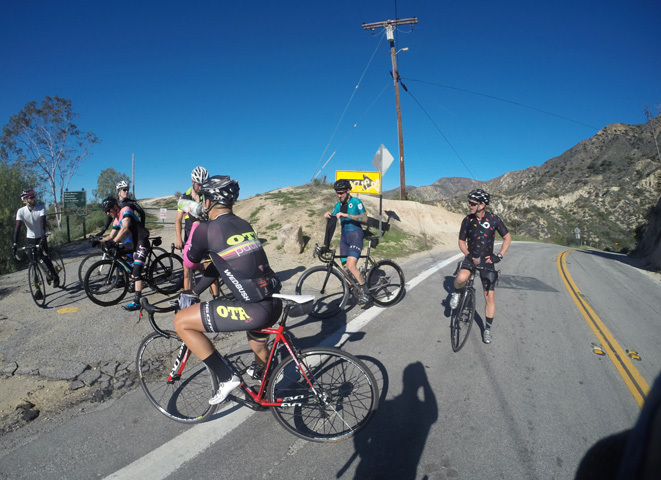 If you happen to be one of those that shows up in clip-ins(not advised), you’re not far from one of the valley’s most interesting climbs. Continuing north on Van Nuys Blvd., you can head a little west and up solitary Lopez Canyon. Your other option is the more easterly residential & cemetaried Kagel Canyon, which in parts reminds you of Topanga Canyon. Both converge at the same spot and have equally difficult finishes, especially as you’re battered down from headwinds coming off the mountains. Kagel Canyon also contains a bit of urban myth in what is known as “Gravity Hill”, which is covered by a bunch of YouTube videos. From my ventures, I say it’s an urban myth, but find out for yourself. If you think you’ve had enough, stay tuned! Part two coming tomorrow!